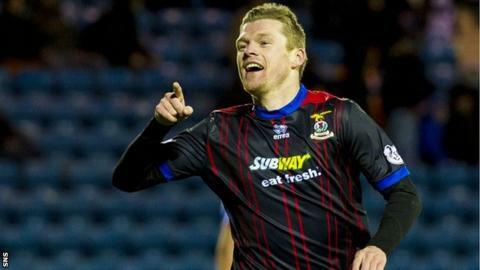 Inverness Caledonian Thistle manager John Hughes says Wigan Athletic's offer to sign striker Billy Mckay was "too good to turn down." Mckay is in Wigan completing the deal, although Hughes refused to reveal the fee involved. "For once it's nice to get a little bit back for all the work and effort you've put into someone." Northern Ireland international Mckay, 26, is out of contract at the end of the season. Since joining the Highlanders from Northampton Town in 2011, he has scored 62 goals in 141 appearances. So far this term, Mckay has netted 10 times and Hughes recently said he expected the forward to leave at the end of the campaign. "Billy wanted to go down south and he goes with our best wishes," added Hughes. "He's been an absolute joy to work with. "He'll be missed, his goals will be missed but we'll just have to find another way to win football matches." Hughes challenged his offensive players to take the opportunity to step into Mckay's boots. "We've got plenty players in terms of the final third of the pitch, but we've not got too many in terms of Billy's calibre who want to play right on the shoulder and over the top. "I'm looking for one or two of them to take on the mantle and step up to the plate. " The club are looking to potentially recruit a replacement but will be working within the loan market. "I don't think we're in a situation where we're going to buy someone." "There's plenty players out there if you cast your net far and wide. If you've got a good network, you can go and get a couple of loans. It probably might be that between now and the end of the season. "It wasn't that long ago when there were the Munros, Tokelys and Hayes and Rooneys. Look where we are now. What to do is to keep moving it forward and try and get that kind of replacement." Inverness, who seek a sixth straight victory when they host Ross County on Saturday, will also lose Graeme Shinnie this summer after he signed a pre-contract with Aberdeen. "There's always an excitement to see if we can go and replace that," said Hughes. "We have to work very hard on our recruitment to make sure we're making the team every bit as good as it is right at this moment in time. "There was a part of the season where (McKay) he wasn't scoring and we were still winning games. So there's plenty ways to win a football match. There's no reason why we shouldn't just keep going from strength to strength."